I developed a Caesar Salad habit when we first participated in a CSA, as a response to the bounty of lettuce, farm fresh eggs, and my spring salad cravings. My favorite Caesar recipe is in Arthur Schwartz’s Cooking in a Small Kitchen (a cookbook I love so much, it’s losing pages). I adapt the recipe to use a blender jar – it’s quicker, and extra dressing can simply be stored in the jar. Combine all ingredients in a blender jar. Blend until creamy, about 30 seconds. 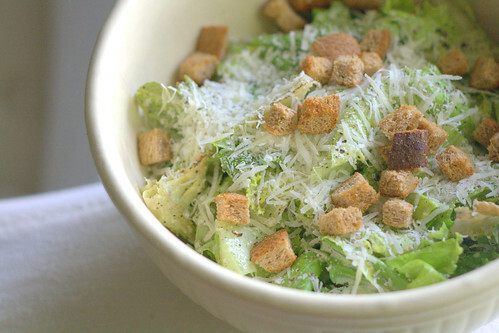 Toss dressing with romaine lettuce. Lately I’ve been skipping the croutons and just topping with thick shavings of Parmesan, which I make with my favorite OXO vegetable peeler. * I don’t, as he does, coddle the egg. If you are wary of raw eggs, you can coddle an egg by boiling water, turning off the heat, and placing the egg – with the shell still on – in the water for a minute.